For years, the Cosmetics industry has been tapping various food sources, searching for the next big skin care product. In 2019, Mintel expects the food industry to focus that attention back where it started. Fruit stem-cell cleansers, olive oil lotions, and creams derived from algae have all found success in the beauty world for their abilities to help stem or reverse the effects of outward aging. These products amount to a massive industry trend building over the past several years; thanks largely to the perception that naturally derived ingredients are healthier than traditional cosmetics. This consumer beauty interest mirrors food industry trends over the same time, with focus on clean labels, non-GMO, and organic products. What the cosmetics industry has achieved over that period is a robust market segment that also recognizes many ingredients we think of as healthy to eat are also capable of easing or reversing the aging process. Various diet trends are now built around the anti-aging properties of fiber, antioxidants, and collagen. This movement expands previous understandings of how these foods are good for you and highlights how they are useful in fighting many problems associated with aging. Fiber, it is understood, is necessary for gut health, but now it is emphasized as literally helping consumers to live longer by lowering cholesterol and protecting against type-2 diabetes. Antioxidants became their own sub-genre of healthy eating when it was reported that they fight cell damaging free-radicals; they are now thought to help with the production of collagen as well; both attributes are associated with younger looking skin. Collagen was once just viewed as a tool used by plastic surgeons in the 80s and 90s to create plump lips and cheeks. New evidence suggests that, when eaten, collagen can improve skin directly, as well as ease arthritis and prevent muscles from deteriorating with age. From a purely marketing-based perspective, the cosmetic industry has done a tremendous amount of free press for food manufacturers. Juice Beauty cream sells for $70 per 1.7oz tub of free-radical fighting antioxidants and fruit stem cells, Paula’s Choice offers well branded Flaxseed and Antioxidant creams touting the superfood’s ability to “strengthen skin defenses”, and a gorgeous 1.7oz bottle from Givenchy claims to renew skin using aged algae for $390. If a little bottle of algae face cream is worth close to $400, what an incredible deal Annie Chun’s organic seaweed snacks are at $1.99. 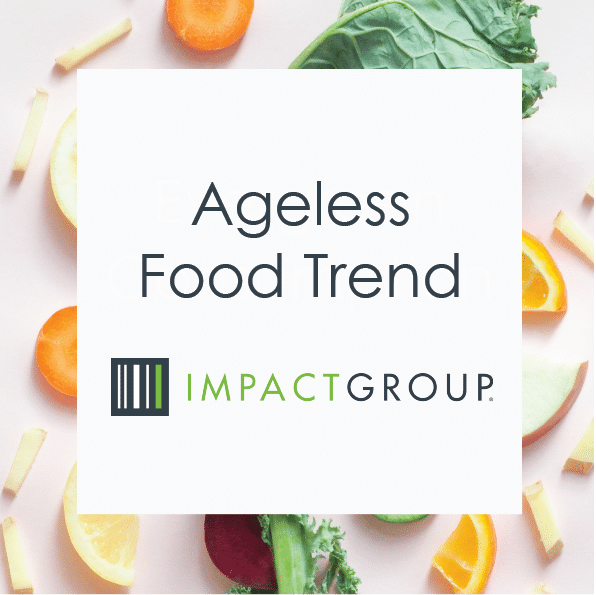 All of the components have been set up like dominoes for the emergence of an entire “Ageless Food” segment, and Mintel predicts just that in 2019. What is so beautifully simple about this notion is that it does not require new forms of production, intensive consumer education, or tearing down of previously held ideals. Food as anti-aging fuel is a value-add concept to all the other positive attributes of superfoods and natural products; the proverbial “but wait, there’s more”. The same product could be marketed separately as gut-healthy and ageless, or all together as a multi-dimensional product depending on the brand’s history and aim. Expect to hear more about a food product’s ability to soften joints, sharpen the mind, and firm wrinkled skin in the months to come.